Good Lord, it is officially HOT. 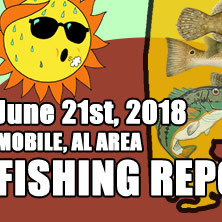 Nice reports coming from around the causeway at the mouth of Blakeley river. Reefs in Mobile bay are doing well too. Early morning/late evening fish the 5-8ft structures then move to deeper spots 8-12+ft up in the day; Dell Williamson (Daphne Pilings), Buddy Beiser, Bender/Austal, Denton Reefs, and the rigs at the south end of the bay. LIVE SHRIMP is the way to go right now! Under a popping cork in 4-6ft and on a slip cork in 8-12+ft. And if you're fishing boatless, the EARLY morning wade fishing bite on Dauphin Island has been great. Good luck out there and watch out for those afternoon squalls. Tight lines and God bless!